Twenty years ago, “Die Hard” was released to movie theatres. The film made Bruce Willis a superstar and John McTiernan an A-list director and raised the bar on the action-adventure film genre. It was also a fantastic and memorable moviegoing experience, especially when viewed in the high-quality 70-millimeter format. Theo – Clarence Gilyard, Jr. The Nakatomi Plaza featured in the film is the Fox Plaza, the Los Angeles corporate offices of 20th Century Fox Film Corporation. “Die Hard” is based upon the 1979 book “Nothing Lasts Forever” by Roderick Thorp. The world premiere of “Die Hard” was held on 07 July 1988 at the Samuel Goldwyn Theatre in Beverly Hills, California. “Die Hard” was released initially in North America in 21 theatres in 20 markets on Friday, 15 July 1988, all exclusively presented in 70mm (see list below). One week later on Wednesday, 20 July, the film was released (in 35mm) in 1,255 additional theatres throughout the United States and Canada. Bruce Willis received a reported $5 million salary for his acting services, despite having appeared in only two feature films and having no track record in the action-adventure genre. Arnold Schwarzenegger, Sylvester Stallone, Burt Reynolds and Richard Gere all reportedly passed on playing the role of John McClane. “Die Hard” was nominated for four Academy Awards: Film Editing, Sound, Sound Effects Editing, Visual Effects. The film won a BMI Film Music award for Michael Kamen’s original score and a Hocho Eiga Sho (“Best Foreign Picture for 1989”) from the Japanese newspaper Hochi Shimbun. 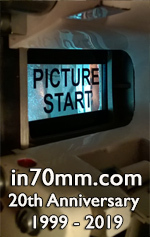 For the theatrical film prints, a spherical film element of the 20th Century Fox logo that opens the film was used instead of an anamorphic element, resulting in a noticeably stretched-out image. The effect was repeated on “Die Hard 2” but corrected for the home video versions. “Die Hard” spawned three sequels: “Die Hard 2” (1990), “Die Hard With A Vengeance” (1995) and “Live Free or Die Hard” (2007). “Die Hard” inspired the high-concept story-idea expression: “Die Hard on a ______”. The musical score during portions of the film incorporates cues from other 20th Century Fox films, including “Aliens” (1986, composer James Horner). Translated international-release titles include “Hard to Kill” (Spanish, Latin America), “The Glass Jungle” (Spanish, Spain), “Big Building Fight” (Thai), “Operation Skyscraper” (Norwegian and Swedish), “Die Slowly” (German), “The Crystal Trap” (French and Italian), and “A Hard Nut To Crack” (Russian). The following is a list of the 70mm Six-Track Dolby Stereo presentations that were booked for the film’s exclusive, limited-market release. These were, arguably, the best cinemas in which to experience “Die Hard”. Sources/References: Numerous newspaper articles, reviews and advertisements; and Boxoffice; Boxofficemojo; Cinerama and Large-Frame Exhibition in Canada; the motion picture “Die Hard” (1988, 20th Century Fox); The Hollywood Reporter; Internet Movie Database; Newsweek; Time Magazine; Variety. Michael Coate is a journalist and film historian. He has contributed to American Cinematographer, Boxoffice, Replication News, Sight & Sound, Widescreen Review, and the websites CinemaTreasures.org, FromScriptToDVD.com and In70mm.com. He was Widescreen Review magazine’s Research Editor from 1997 to 2004. In 2004, he co-founded FromScriptToDVD.com, and in 2008 formed Fans of Showmanship, a Yahoo! Group focusing on the discussion of film history. Attending Major League Baseball games across the USA is Mike’s hobby when he’s not haunting libraries around the globe looking to unearth useful facts about film history. He is a graduate of the Radio-Television-Film program at California State University Long Beach and resides in Los Angeles.